However, as much as her public image and private demons may have conflicted with reality, there is no gainsaying that Stewart was a highly innovative businesswoman, boldly going where no man (or woman) had gone before. In 1982, she burst into the American consciousness with her first book "Martha Stewart Entertaining" (which was published by her husband's company). In 1987, she signed a lucrative deal with the giant retailer Kmart to develop an exclusive line of low-cost, but tasteful, merchandise. In 1991, she published her first magazine, "Martha Stewart Living", and in 1993, debuted her first TV show, also called "Martha Stewart Living". 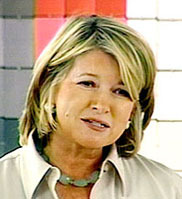 In 1997, Stewart established her own company, Martha Stewart Omnimedia. Within a short time, she expanded her eponymous and seemingly ubiquitous business far beyond the traditional boundaries of domestic merchandising. The Martha Stewart brand name was attached, not only to books, magazines and TV shows, but to radio spots, a newspaper column, a large mail-order/Internet business, as well as the thriving Kmart product lines. In 1999, Stewart took her company public making her, on paper, a freshly minted, yet tasteful, billionaire, the reigning queen of domestic consumption. However, it was not to last. On July 16, 2004, Stewart was sentenced to 5 months in prison, followed by 5 months home arrest and 2 years probation (to be served concurrently). She was also fined $30,000. Bacanovic received the same sentence, but with a smaller fine. Barely four months later, on October 8, 2004, an unrepentant Stewart  newly rechristened as U.S. federal prisoner #55170054  surrendered to officials at Alderson Federal Prison Camp in West Virginia to begin serving her sentence.